A Texas ranger in the family! We’ve got us a Texas ranger. A real-live (well, um, okay, so he’s been dead for 121 years1) Texas ranger. And not just in a collateral line2: this guy is my 2nd great grandfather George Washington Cottrell. 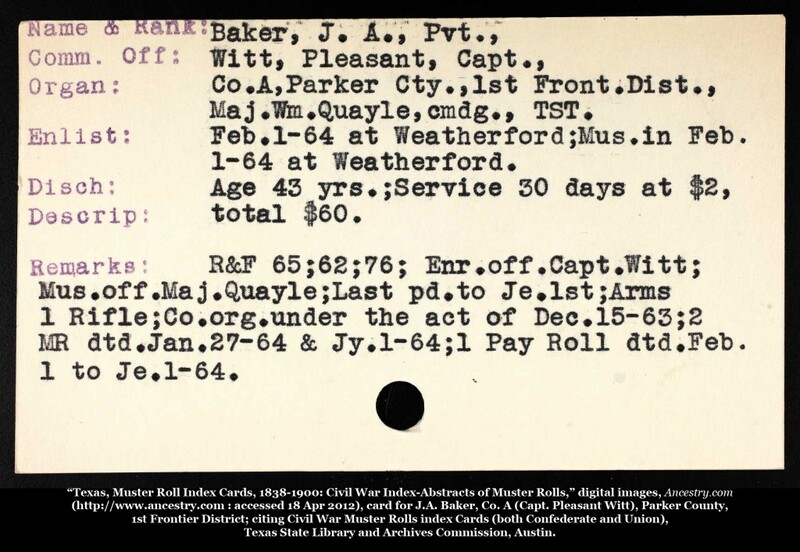 One of the units raised as the result of this 1863 statute was Company A, from Parker County, commanded by Captain Pleasant Witt, in the First Frontier District, commanded by Major William Quayle.8 Two muster rolls and one payroll survived the war and are now in the Texas State Library and Archives Commission in Austin, where they and most other Civil War-era military and ranger records have been reduced to index cards capturing the key information, much like the Compiled Military Service Record cards in the National Archives for those who served in Union and Confederate units. I was thinking this might mean we’d finally proved that we had a direct ancestor with Confederate military service until I did some research into the Texas State Troops, the Frontier Organization and these companies of the Frontier Districts. No, we still don’t qualify for the Daughters of the Confederacy — we expect we’ll eventually prove we will (a prospect this Yankee finds a bit disconcerting) but not today. Because the men of Company A weren’t Confederate troops; they were actually exempt from Confederate service and protected from Confederate conscription. My mother was proud, all her life, of being a third-generation Texan who could trace one side of her family back to just after the Civil War and the other side back to the Republic of Texas. I’m not sure she ever knew that the Republic of Texas side first shows up in the records when the Republic of Texas prosecuted her great grandfather for bigamy,11 but I think the fact that that same great grandfather was also a Texas ranger just might make up for that. Pretty sure a Ranger trumps bigamy! Congratulations. Next best thing to finding an Alamo ancestor. I would love to see what you’ve got, Cliff! I’ll contact you privately about this, Cliff. Thank you! Here’s were I wrote about my grandfather Henderson B. Alverson. I’ll have to check on Ancestry and see if I can find anything new. Thanks for letting us know about their Ranger Records. I love your blogs, very informative and entertaining. Thanks. Found your article very interesting and helpful. I am research James Hickey. There was a James Hickey from Weatherford that serviced in the First Frontier District, Company A. I was just starting to investigate the First Frontier Distri, when I read your article. It was a great help. Now if I could just find out where he came from I would be in great shape. P.S. One of my great grandfathers was wound in the confederate calvary. Glad I could help, Jim! Best of luck in tracking down where your James Hickey came from! Great story Judy! 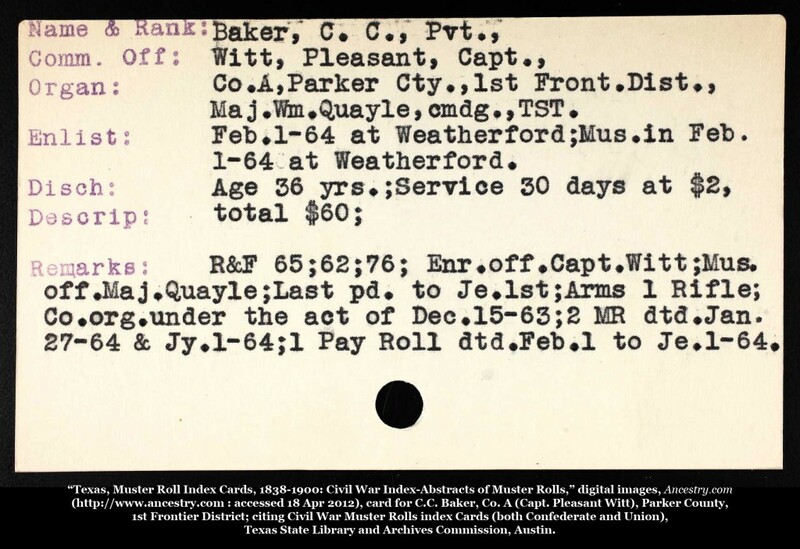 I only recently found that three of my maternal 2nd Great Grandfathers who were in the Frontior Guard, Texas State Troops. 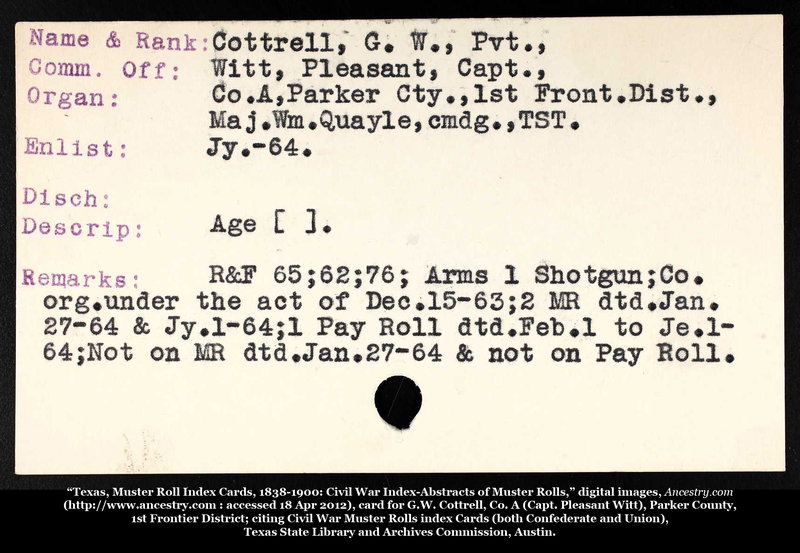 And, two of them continued their service in the Confederate Army through the end of the war. I was really excited to learn of the Texas Ranger connection from a distant cousin whose hobby is finding their burial places so they may be so honored. Hd located over 100 so far and more than 50 of those in the Fredericksburg, Texas area alone. Nothing wrong with being a yankee. TST (Rangers) were in some cases folks that chose not to fight the Union, Gillespie, Blanco, Llano and Mason counties had a lot of German immigrants that were “Tru der Union” (google the term) and a compromise was worked out for them to serve in the border regiments instead of confederate units. My paternal 2X great grandfather served in Gillespie county unit and his younger brother served in Llano county unit. The confederates in my family were all on my paternal grandmother’s side. Good to know, David, thanks! My great great grandfather, Henry Sackett was 1 of Malsby’s Minutemen. He bought the Army post in Coleman County in 1870. Camp Colorado, now a historical marker. I’m also a direct descendant of Davy Crockett. Seventh generational uncle. My brother’s first name is Crockett. My sons middle names arc Crockett. on top of that, the Comanche Indians they were battling is my Dad’s side. He is half Comanche from the same tribe. Three generations later they marry and then there’s my brother and I! My father’s side General Mills, also fought at the Alamo. The Comanche Indians and General Mills of the Alamo from my dad side and henry sackett Texas Ranger who purchased the actual army post and Davy Crockett from my moms side. I’m so proud!